BANT Wellbeing Guidelines are evidenced-based guidelines providing information on nutrition and lifestyle measures when personalised advice is not possible. The guidelines are equally well suited as the starting point for use by Nutritional Therapists and healthcare professionals to further personalise the recommendations to their clients and patients. 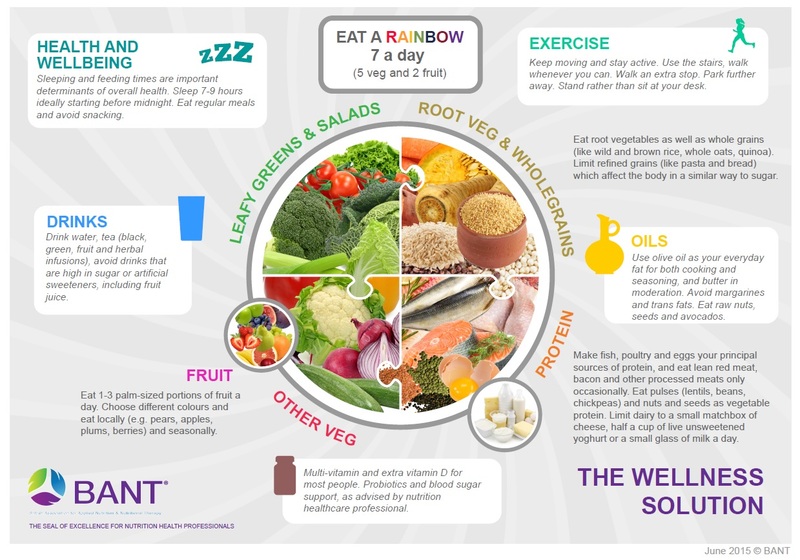 In addition to a comprehensive review of the latest research, the BANT expert panel reviewed the current Eatwell Plate, which unfortunately is now out-dated, US Eating Guidelines and Harvard Eating Plate among other published guidelines, to design the newly published BANT Wellbeing Guidelines. The original versions of these guidelines were subject of a public consultation in September 2014. The consultation resulted in a wide spectrum of respondents from healthcare professionals and members of the general public. All feedback was carefully reviewed and further contributed to the development of BANT Wellbeing Guidelines. BANT Wellbeing Guidelines start from the premise that everyone is different and while there is no set rule that fits, all these guidelines provide a basis for healthy lifestyle. BANT recommends that people visit a Registered Nutritional Therapist for more personalised recommendations to help them achieve their goals. Click here to find a Registered Nutritional Therapist in your local area. You can view, download and print the guidelines below. BANT members can purchase copies of the Wellbeing Guidelines via the online portal. Food and Health – Why do we need to eat? 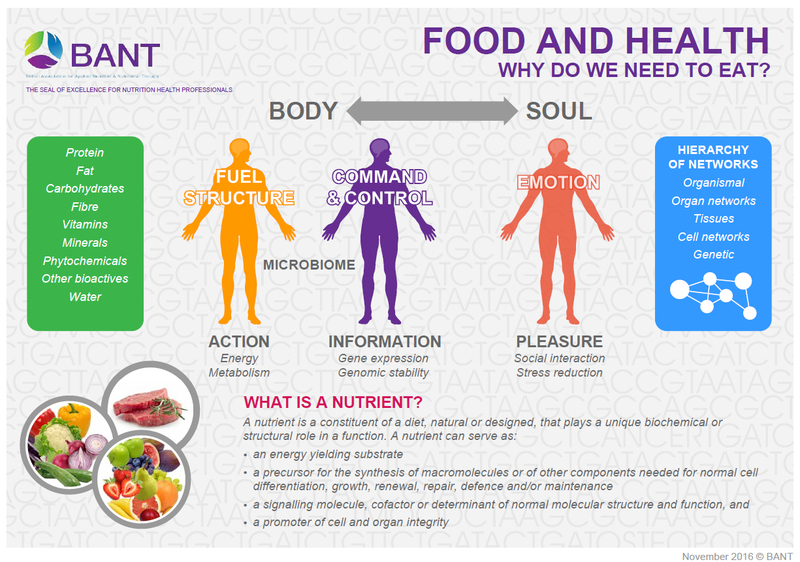 This poster explains the complex and far reaching role of nutrients to our health. Nutrients are not just about energy metabolism fuelling our structure but also about promotion of cellular and organ integrity and our emotional wellbeing. Body and soul provide a holistic whole to enable action and to provide information to promote genomic stability and pleasure in form of reduced stress, wellbeing and social interaction. 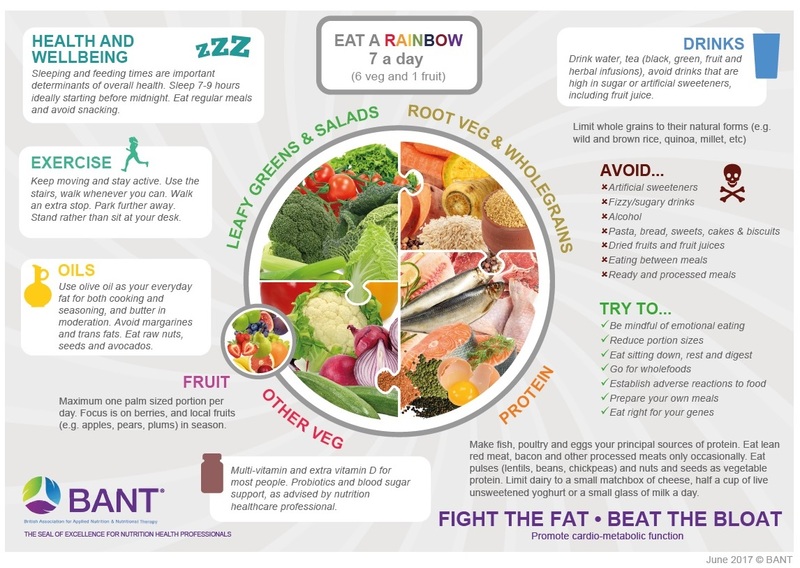 General advice as a healthy dietary and lifestyle guidelines when personalised advice is not possible or as a basis for further personalisation and a visual aid to clients. Everyone is unique but whatever your goal, similar nutritional principles and health and wellbeing guidelines will apply.